The Defender of Florida DeMolay award is for Active DeMolays who First Line Sign two (2) New Members in the same calendar Year. 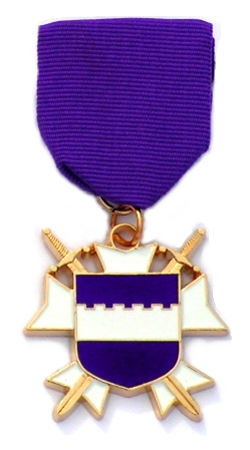 This is the Purple Defender’s Shield medal. 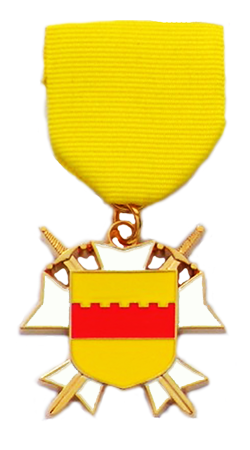 The Commander of Florida DeMolay medal is awarded to the Master Councilors of each Florida DeMolay Chapter that reaches their annual membership goal and who initiate at least half of that goal within their Term of Office, will earn the Gold Shield of Honor. Our Annual goal is currently set as: eight new members per Chapter. Therefore, the minimum for this award is eight new members, with at least four new members initiated in a term of office for the Master Councilor to qualify for this award in term. Both Master Councilors may qualify if at least half the annual goal are initiated in each of their terms. In the case of both awards, all paperwork must be correctly filed with DeMolay International and properly recorded in DeMolay International records before the new members count towards the award.